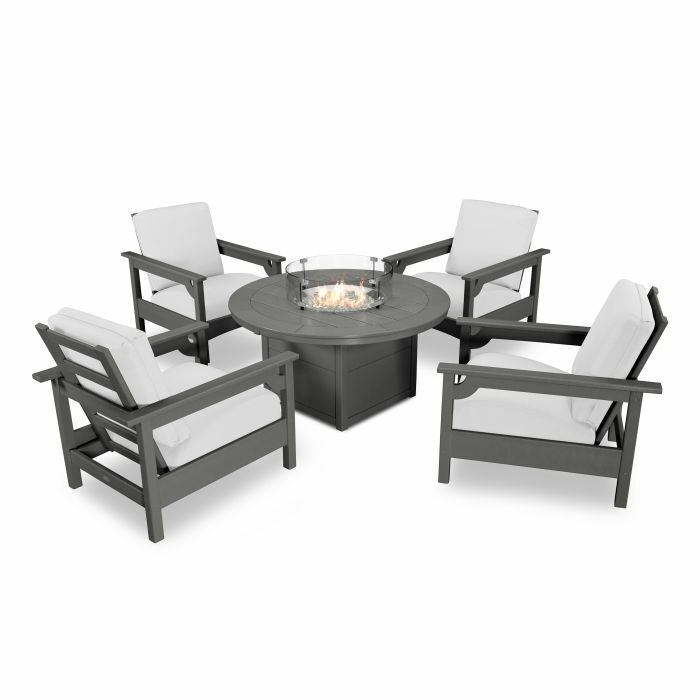 The Club 5-Piece Chat Set with Fire Pit Table comes with four Club Deep Seating Chairs and one Round Fire Table. Fast-drying Sunbrella® cushions are resistant to sun, weather, salt, and mildew. Durable, weather-resistant fire tables create an adjustable flame that is easy to control. Liven up your outdoor space with the ultimate comfort and style of our Club 5-Piece Chat Set with Fire Pit Table. The addition of a hassle-free fire table creates the perfect centerpiece — just press a button for a roaring fire that requires virtually no maintenance. Break out the snacks, let the good times roll, and chat the night away under a blanket of stars.